I love traveling, but I don't love traveling for work. I don't have to travel very often, but when I do, I always hope for good restaurants or something like that to make it a bit easier to be away from home. Last month I was in New Orleans and although it's never easy to be away from the wife and kids, I had a great time eating while not working. This week I've been in Denver. Can some one please tell me - what is going on in Denver? I've been here twice now, been in a few restaurants, and I have yet to encounter a bottle of wine that I wanted to order. It's all poorly chosen California wine. I've seen the odd bottle of Guigal Côtes de Rhône, perhaps a Jadot Bourgogne, but essentially only American wine and none of it particularly interesting. Denver has great beer, a lot of it local. Do they just not bother with wine? Am I looking in the wrong places? Are Dressner's or Lynch's or Rosenthal's or wines of that ilk even distributed in Colorado? Last night after our meetings were done I went with my colleagues to dinner at an upscale Mexican place. There were 6 of us. I keep my work life and my wine life separate, not for any particular reason at this point, but wine is a hobby that I don't trumpet. If it comes up or if asked, sure. But situations like the one at this restaurant make me nervous because I HATE drinking crappy wine, and yet if people at the table want wine, I'm going to drink it with them. And there is no conceivable scenario in which I would say to these people that I do some work for but don't know well, "Hey, give me the wine list and I'll pick something." The host will pick and that's that. You've been there too - you put your own stuff aside and roll with the group. When the server came to take our drink order the women at the table ordered wine, and then one of the guys, and I was getting ready to accept my oak-chip-deep-purple 15% Cali-cab fate. But then, a miracle! The next guy, the host, ordered a Margarita, and specified some or other gold Tequila. A wave of relief washed over me, and I smiled and said "That sounds good - I'll have one too. Make mine Herradura silver, rocks and salt." I had more work to do later that evening, so I had only the one, and let me tell you that I savored every sip. One other thing - I have this superstition that compels me to open a good bottle of wine with my wife before I go away on a trip. This time I took another shot with the 2006 Domaine de L'Arlot Clos des Forêts St. Georges, which I bought on closeout for $50, Daniel Johnnes Selections/Michael Skurnik Wines. The last bottle was corked, but this one was beautiful. Yes, it's very young and it's showing only a fraction of what it will become, but what's here now is completely delicious. 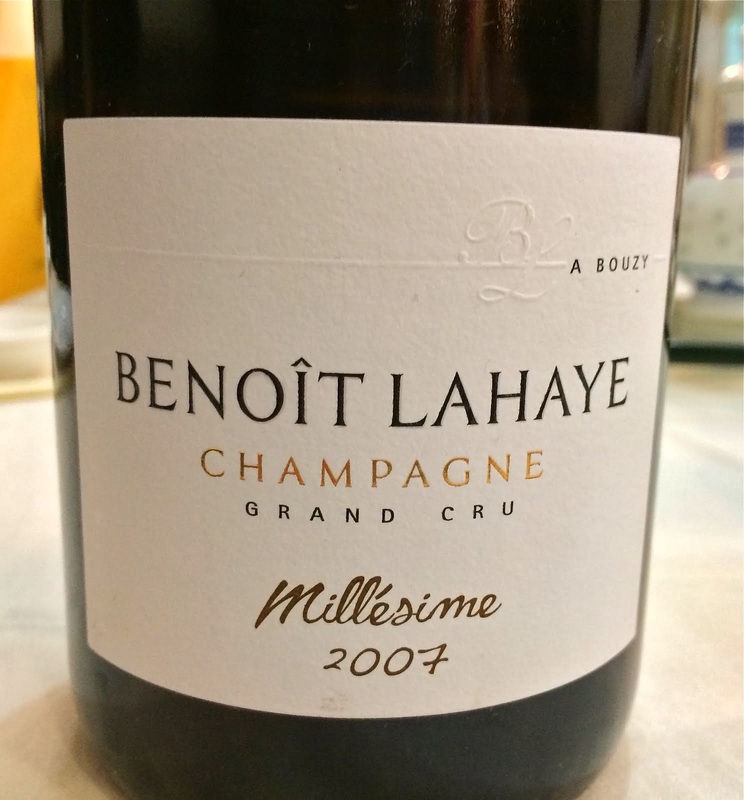 The fruit is primary and dark, very juicy and sweet, and the wine shows great balance - good acidity, firm but gentle structure, everything is working. After about 20 minutes in the glass the telltale sauvage character of Nuits St. Georges emerged. I think this wine is going to be great 8 plus years down the road, and I'm psyched to have another bottle to save. Assuming there are no delays, I'll get home to Brooklyn tonight, too late to see my kids or my wife, but let me assure you that tomorrow night I will open something good to help chase the Denver blues away. The other night BrooklynLady and I went to dinner at Vinegar Hill House with Peter Liem and Dan Melia. We had a great time and I thought the place essentially lived up to the hype. Forgotten New York neighborhood, lovely decor, even if painstakingly mussed like a Williamsburg cool-cat's hair. Appetizers were fantastic, the rest of the food very good too, everyone was happy. And someone over there loves wine, because there are many enticing things on that list at fair prices. While we were waiting for our table, and part of the way into our appetizers, we drank 2007 Romano Clelia Fiano di Avellino,"Colli di Lapio". Fiano is something that Levi Dalton has poured for me several times now, and he feels that it offers perhaps the best raw material of any white grape in Italy. This wine was so well made, and just delicious, vibrant and well balanced. And my last smokey sip was a ridiculously good match with grilled charred octopus. Our 1998 López de Heredia, Gran Riserva Tondonia Rosado showed beautifully too, and worked with everything on the table. Fleshy, oxidative, focused, pure, this wine is its own special thing and if you haven't yet had it, at about $25 retail it's just spiteful of you to continue not trying it. Especially now after a year or so since release - this wine has never shown better. We moved onto the 2007 Agnès et René Mosse Anjou Les Bonnes Blanches, and I'm just not a fan. I know that all the cool-cats love Mosse, and they are darlings of the natural wine scene, but for me the wines are hit or miss. This one showed a lot of volatility and simply wasn't very interesting, but it didn't matter - Opici "Chablis" couldn't have darkened our mood at that point. Dinner with company like this is always great, but on this particular evening there was a nice little ancillary benefit. Dan arrived right from work, and his work is selling Mosel Wine Merchant Riesling. He schlepped 20 wines with him in a crumby red Toyota Tacoma (it might be in perfect condition for all I know, but in my mind's eye it's crumby) to Prune and TriBeCa Terroir and Blue Angel, and lots of traffic and other hassles later, he arrived at my house. He brought four great Rieslings with him for us to enjoy as apertifs, and then tired of the schlepping, Dan left the bottles with me. How cool is that? These were all 2008's, all harvested at the Spätlese ripeness level, but they are all dry wines. Well, only two of them are technically trocken wines, but the other two drink as if they are dry wines. These are some of the top wines from each producer and it was quite a treat to enjoy them over the next few days. A few notes to follow, but since I have precious little experience with Riesling, my notes aren't all that interesting. What I can tell you, is that as a group, these wines have a common thread. They are remarkably pure, they are delicate and detailed, they have great intensity and length, and they are very much of the soil. They are great wines, and if they were Burgundies, they would cost upwards of $75. But they are dry German Rieslings, they typically require the hand sell, and none of them will run you more than $35 - honestly, a bargain. 2008 Peter Lauer Saar Ayler Kupp Riesling Fass 12 Unterstenbersch, $35, Mosel Wine Merchant. I suppose if I had to pick a favorite, this would be it. A bit of sponti natural yeast fermentation musk on the nose, deeply earthy and mineral too. Pure, vibrant, sweet fruit, a delicate springwater feel to the wine, but also intense and with great length. The thing that killed me about this wine is that is so intense and still is a wine of such finesse. Lauer is not using the typical German wine language, and the label says nothing about must weight at harvest or dryness level. Instead, Lauer describes the terroir, in this case at the bottom of a south-facing slope just west of the Saar river, from 50-year-old vines. is all herbs and rocks and bitter pits and the length honestly is rather startling. This wine is not yet available in the US, but it will be soon. A bit more about it here, from Lars at Mosel Wine Merchant. 2008 Stein St. Aldegunder Palmberg-Terrassen Spätlese-trocken, $26, Mosel Wine Merchant. Perhaps the most delicate of the lot, this wine also showed the most overt fruit - lots of apricots. Very pure and fine, intensely mineral, and the creamy mid-palate merges with the very mineral finish that lasts forever and buzzes with some sort of herbal honey. Such a delicious wine. 2008 Knebel Winninger Röttgen Spätlese-trocken, $36, Mosel Wine Merchant. More muscular than the others, more concentration. Also a bit more fruit on the nose, with green melon, but still a wine of rocks and bread. Energy, depth, finesse, purity - I've said the same thing about each of these wines, but it's true of each. One more thing I can tell you - this wine had already been open for 48 hours when I mistakenly left about a glass in the bottle, same for the Stein wine, overnight and out of the fridge with no stopper. And the next day at 1 pm they both were excellent with our fluke lunch. The other night my friend Peter came over for dinner. We was supposed to have flown from New Orleans to France, but he said something about a Volcano and he couldn't fly. I can't tell you how many times I've heard that one. Next time I'm late for anything, that's going to be my excuse. Anyway, I've been really busy lately with work and I didn't have time to shop for and cook anything fancy. And after I decided what to make, I found myself unable to make decisions about the wines to serve. I felt kind of frustrated, actually, like I already knew all of the wines I have, and I wanted something excellent but different. So I decided to do what I do when I feel that way about my music (which is far more often) - I asked Peter to be the guest sommelier. When you ask a guest to pick the music, you have to listen to whatever they choose, even if it's that crappy Freddy Hubbard greatest hits disc. Same rules apply with the guest sommelier game. I told Peter what we would be eating and said that he should think about what he'd like to drink - anything. If I have it, we open it, no matter what it is. We had this conversation just as Peter arrived, over a plate of Speck and a bowl of olives. For this I chose the wine, a fantastic bottle of Lustau Almacenista Fino del Puerto Sherry, $25, Christopher Cannan Selections, Michael Skurnik Imports. Lustau's Almacenista Sherries are solera matured by smaller growers and producers, and distributed by Lustau. This fine Fine del Puerto is matured by Jose Luis Gonzales Obregon. Old Skool Joe recently wrote about this exact wine, which he drank next to another classic Sherry, Valdespino's "Ynocente." His thoughts are, as always, worth reading. We enjoyed this Sherry immensely, with its weightless intensity and smokey walnutty depth. --Spaghetti with ramps, cooked in a base of butter, capers, anchovies and white wine. --Grass fed sirloin steak cooked this way, salsa verde, and raw kale salad in olive oil and a dab of fish sauce. --Oma, a raw cow's milk washed rind cheese made by descendants of the original Von Trapp family, and aged in the Jasper Hills cellars. I'm telling you, there are some truly fantastic cheeses coming out of small farms in Vermont and New York these days, and this is one of them. Peter thought about it for a bit, watched me put the simple pasta dish together, and much to my surprise, said that he wanted to just keep drinking the Sherry with the pasta. In my many vacillations before Peter took over as sommelier, I never considered Sherry. "There are ramps, capers, and anchovies in there," Peter said. "Those are assertive flavors. You could go with an acidic white wine, but I think Sherry will be great." And it did work out well, although we agreed later that next time we'll try a dry Riesling with that dish (and that Peter will drink Sherry with anything). When it was steak time, Peter said that if not for the salsa verde he would want something like a 1970 Mouton. "But Cabernet is so inflexible," he said. "The assertive herbal flavors might mess with Cabernet or Merlot. 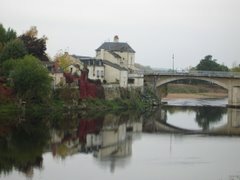 What do you have from the Northern Rhône?" When I asked why Syrah would work if a Bordeaux wouldn't, Peter said that Syrah is very similar to Cabernet in structure, but far more versatile with food. Sounds good. I don't have much in the way of Northern Rhône wine. What I have is good, but there's not a lot to choose from. Peter selected the 1999 Noël Verset Cornas, $65, Kermit Lynch Imports (although this bottle came from Crush and they bought it from a private collection). This wine was just amazing. My first time with the '99, and it seriously outclasses the delicious 2000, in my opinion. Deeply beefy with interlocking gamy and floral notes, this wine never stays still. So energetic and vibrant, such compelling depth, so wonderfully balanced (only 12.5% alcohol! ), and a lovely delicate texture for such a powerful wine. What can I say - we loved the wine and it was perfect with the food. I was sorry to see it go, and again reminded of how much worse off we are that there will be no more wine from Noël Verset. For the cheese, Peter asked if I had any white wines from the Jura. I had almost nothing to choose from, but we were both pretty psyched to drink the 2000 Houillon/Overnoy Savagnin, $31, Louis/Dressner Selections. I've had this wine before and this was not the best showing. It tasted great, although it didn't have the typical vibrancy. But the nose was in a weird place - it was exactly like an orange wine, like the Paolo Bea Arboreus Umbri Bianco I recently had. It was a leaf day - perhaps that impacted the way the wine showed. Or perhaps it was simply too young, as Peter guessed. It was very good with the cheese though, and once I was able to stop wanting my memory of 2000 Houillon Savagnin, and start appreciating what this particular bottle smelled and tasted like, I enjoyed the wine very much. I can tell you that I would not have selected these wines with these dishes, and that is exactly what makes the guest sommelier game so much fun. You should play some time. Two Things that Weren't Supposed to be Good, but Were. There really is no point in me trying to make ramen - it's just not going to happen. It would be like trying to make sushi. I could eat raw fish slices with vinegared rice, but it requires many years of training to make sushi. Ramen too. So instead, I used ramen as the inspiration for noodle soup. Who puts asparagus in ramen? Perhaps I am the first human ever to do so. Tofu, that's reasonable. Egg - necessary. Fried shallots? They certainly were delicious, but it is their distant cousin the scallion that appears in ramen. Daikon radish is also not a typical ramen topping, but these are the things I had in the house, and I like these things. Why shouldn't I put them on my "ramen?" Notice how I've completely glossed over the fact that I made my "ramen" with...soba noodles? Heresy. The one genius stroke here, if I may say so, was the last minute inspiration to use miso as a base for the soup. I was going to mix my home made chicken stock with a bit of good soy sauce, maybe a little vinegar and garlic. But instead I ladled some of the warm stock into a bowl of country miso paste (the coarse brown kind), whisked until smooth, and pushed through a strainer into soup bowls. Then the soup stock, then noodles, then the toppings. My kids devoured their smaller portions of this (except the shallots - they didn't go over well), and as completely wrong as this "ramen" was, it was delicious. And because thus far I had so strictly adhered to tradition, we drank Chablis with this meal. On paper it's all wrong, I guess, but it seemed like it might work. And to be honest, I really wanted to try one of the bottles that I recently received in a sample pack, what is surely the most thoughtful sample pack I've ever received. I don't receive a load of samples, which is a good thing because it's so rare that some one wants to send me something that might fit in with the things I write about here. This one was a total surprise. I wrote something not long ago complaining about money I spent on William Fèvre Chablis. The folks at Henriot (Fèvre's US importer) must have read the post and felt that my experience was atypical, and so they sent me a mini-boatload of Fèvre Chablis, a great map, lots of information about the wines, and a nice book of recipes that are meant to enjoy with Chablis wines (ramen is not one of them). 2006 William Fèvre Chablis 1er Cru Montmains, $30-35, Imported by Henriot, Inc. This is a wine from the négoce arm of the Fèvre operation (the estate grown wines are called Domaine William Fèvre). 2006 wasn't supposed to be such a great vintage in Chablis, from what I've heard. And I am already of the mind that I'm not a big Fèvre fan, and this isn't even one of the estate grown wines. But you know what - it was very good. A bit backwards upon opening, but with a bit of air it's quite lovely with definite high notes of seashells and iodine on the nose. Lemony, stony chardonnay fruit on the palate, a lot of sappy raw material still, but good intensity without being clunky. This wine is not as vibrant as some, but the shells continue on the finish and this couldn't be anything but Chablis. And it somehow worked perfectly with our savory miso inflected "ramen" with soba noodles, asparagus, and fried shallots. How would this wine hold up next to de Moor's or Picq's wines? That's something I'll have to look into soon. Some wines sell themselves. Consumers know about and want these wines, and do not require any discussion with sales staff in order to buy. Not being in the business myself, I don't know for sure which wines these are, but I'm guessing things like high end Bordeaux, cheap Malbec or rosé, or most any California wine in the $20 and under price range. Then there are wines that simply will not sell without some special urging. Think of the customer that walks in and says "I want a dry white wine and I don't want to spend more than $20." 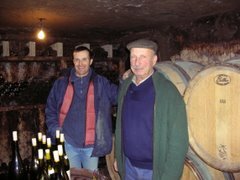 If left to their own devices, are they going to decide on Clos des Briords? I don't think so. The bottle is shaped funny, and what the heck is Muscadet anyway? Actually, Clos des Briords and particularly a wine like Granite de Clisson are probably not good examples here because they also sell themselves. To a far more limited audience than high end Bordeaux, let's say, but there are people (count me as one) who anticipate Granite de Clisson the same way others anticipate Bordeaux futures. Think back to the days when you were in the early stages of learning about wine. If you wandered into a retail store, would you have picked out a bottle of $24 Granite de Clisson? If that's the bottle you got, it's more likely that you would have told one of the staff about some of the other things you enjoy drinking, and that person might have asked you "Well, have you ever tried Granite de Clisson?" Five minutes later, after they helped you to develop some context for the wine, you bought it. It's easy to forget that there are many wines that I love, you too probably, that require conversations like the one above before they sell. Entire categories of great wine - Beaujolais and Jura to name two. If you don't already drink those wines, even if you drink wine several times a week, who wanders into a retail store and picks out a $20 Morgon or a $29 Trousseau without help from the staff? I guess this is why the stores that carry those wines tend to be the stores that employ intelligent and well-trained sales staff. How else can you move the wine? And make no mistake, as much as we all respect Clos Rougeard, it doesn't make sense to have $45 Saumur-Champigny sitting on the shelf for over a year. The wine has to move. The other day I was in Astor Wines and I noticed a few bottles on the shelves by Henri Milan, a producer that I really like in Provence. I said to the wine buyer "Wow - I love Henri Milan wines, that's so great that you carry them." She said "yeah, I think they're great wines, but Henri Milan was in town last week and I had to get him in here to train my staff on how to sell them before I agreed to carry them." This is Astor Wines, one of NYC's mecca's for great wine, and Henri Milan is, as she put is, "completely a hand sell." Makes sense I guess - the wines start at $25 for a VdP and go up to over $50 for his top wine, a gorgeous Syrah blend called Clos Milan. But the wine isn't one of the spectacularly popular Provence wines, like a Bandol for example. You have to know what it is before dropping $50 on Clos Milan, or $25 on the VdP, never mind $35 on the VdP white blend. 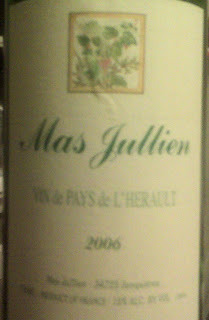 Last week I was hanging out with my friend Clarke who represents Neal Rosenthal's wines, and he poured me something that I had never heard of, a white wine from the Languedoc by Mas Jullien, the 2006 Mas Jullien Vin de Pays de l'Hérault. (sorry for the rough photo, but it was taken with a blackberry) I was immediately captivated by this wine. It had been open for almost 2 days and it was showing great balance, an expressive and expansive nose of dark floral and wet stone aromatics, bright fresh fruit that was completely infused with flowers, and that elusive (among Languedoc whites, anyway) combination of richness and intensity with lean texture and energy on the palate. Truly delicious wine, something I would love to explore further at home with dinner. You might have noticed that I didn't give the price of the wine, and that's because as far as I know, no one sells it. Clarke says that perhaps 25 cases come in each year, and so far, only restaurants buy it. When I asked why no retailers have bought it he said "This is the ultimate hand-sell - an over $30 white wine from the Languedoc." I guess there are hand-sells on the importer/distributor side of the business too. There are hand-sells everywhere, come to think of it. I need to think about this more, but it occurs to me that most of the interesting and good things in life are hand-sells. But it's really about the cherry blossoms. They're here for less than two weeks every year, and it's one of those things that's worth skipping work to go and see. We're pretty urban here in NYC, and people are creative in finding the things that signify spring. For me, it's the cherry blossoms. The weather is getting warm and it's time to start grilling. Who doesn't love to grill? Lots of people don't, I would say. And if you will permit me what I hope is a rare moment of holier-than-thou snarkiness, I'll tell you what I mean. Most people enjoy pressing the button that ignites the propane gas as it flows to their cooking apparatus, resulting in a controlled blue flame and thereby producing heat to cook whatever food is placed inside said cooking apparatus. They use a dial to control the flame. Although this may technically count as grilling, it is not what I mean when I say grilling. I'll eagerly and gratefully eat whatever you cook however you cook it, so this isn't about being snobby. I just want to advocate for a different way of doing it. I love the way hardwood charcoal cooks food. It's so much better than the results with propane gas. I know there are inconveniences with this kind of grilling - lighting the coals, controlling the resulting temperature, knowing when to put the meat on, the lengthiness of the whole process, and so on. But the results are so vastly superior to the other kind of "grilling" that it's worth it. Listen - my wife makes fun of me quite often for insisting on cooking this way. I understand that it requires patience and attention. And your wife/husband/domestic partner/friends/relatives/boss/colleagues/etc. will probably make fun of you too if you make the switch, but switch you should. Here are some photos from our first grilling session of 2010, the other night with my pal Adam. We're talking about hardwood charcoal here, no chemicals, no lighter fluid, nothing. This kind of fuel burns cleaner and hotter than "regular" charcoal, such as Kingsford or something like that. To light the coals easily and without using lighter fluid, which imparts a disgusting aroma and flavor to the food, use a chimney. Crumple up some news paper balls underneath, and fill the chimney with hardwood coals. The most important thing here is to leave the vents open underneath the grill so there is air flowing, feeding your burgeoning flame. There is also the choice of newspaper. The NY Times is still the paper of record, so use it, but which section? I personally find that the Sunday style section works best, but Week in Review is good, and so is Travel. Don't use Automobiles or Help Wanted as they will toughen the meat. Light a match and ignite the balled up paper underneath the chimney. Things will get smokey very quickly, and that's fine. I like to wait until the coals are red about two-thirds of the way up the chimney before dumping them into the bottom of the grill. When pouring the coals out of the chimney, dump them in a pile on one side of the grill. You're hardly ever going to cook over direct heat for the entire duration of the cooking time, but if you spread the coals over the bottom of the grill, you'll have to use direct heat the whole time. More typically you expose the meat to direct heat for a few minutes on each side to get that seared caramelized crust, and then move the meat to the other side of the grill, cover, and let it cook indirectly for the balance of the cooking time. I like to be able to hold my hand a few inches above the coals for at least 3 seconds before I begin to sear the meat. This whole thing takes about 45 minutes - and that's before the actual cooking starts. Hence, BrooklynLady's frequent mockery. But she enjoys what comes off the grill, make no mistake. On this early spring night I made Vietnamese style pork chops - marinated in fish sauce and garlic, and served with jasmine rice, grilled scallions and Nước mắm, the Vietnamese dipping sauce made of fish sauce, lime juice, garlic, brown sugar, and chilis. Except that we held the chilis because Adam brought over a bottle of 2007 Denis Bachelet Bourgogne Rouge, about $30, Becky Wasserman Selections, and you know how hard hot chilis can be on red wine. This was one of those dinners that vanished very quickly and left everyone's hands rather greasy. I don't think the wine had finished opening up by the time we were done eating (leaf day until 8 pm, then flat out unfavorable), but who cares? A bite of pork in the dipping sauce, a spoon of sticky rice, a bite of grilled scallion...that was all that mattered. There's the nice weather and the upbeat attitude, but my favorite thing about early spring is the return of the fish people to my farmer's market. We've been hooked (sorry) on Blue Moon fish for years now. The freshness and quality is so far above anything available at retail stores that it's become impossible for BrooklynLady and I to buy anywhere else. This raises a few problems, of course. Although there is plenty to choose from, there are some fish we never get to eat, such as salmon. Blue Moon fishes off the coast of Long Island and there are no salmon there. Hey, whaddaya gonna do. To be honest, we don't miss it. We eat other interesting things, like herring, bonito, Spanish mackerel, skate, trigger fish, black fish, and more. And they usually have free fish racks (head and bones without fillet) which I gratefully take to make stock. So far this spring we've enjoyed skate, fluke, and scallops, and once again been tempted by but passed on shad roe (I know, we're idiots). On Saturday the Boston mackerel looked so shiny and beautiful that I knew immediately what we would be having for lunch - Mackerel simmered in dashi, something that I really have no idea how to make but wanted to try anyway. I added a piece of kombu to some water and brought it to a boil, turned off the heat and added the dried bonito shavings. I let this sit for a few minutes before straining the liquid. I would say something now like "Presto - dashi," but there are probably 14 things that I did wrong in this simple preparation. Anyway, I added a glug of Japanese soy sauce to the dashi and that became the simmering liquid for my mackerel. And here is the part where I really had no idea of the proper technique - there are special pots for simmering, weights for keeping the fish submerged, and who knows what else to produce the firm but delicate texture of proper Japanese simmered fish. Without a clue as to the proper technique, I simply kept the heat very low and let the fish simmer until it seemed done. Improper technique notwithstanding, the fish was delicious. I served it with rice, chopped scallions, and grated spicy green radish with sesame oil. I still have no Sake in the house and I didn't have a Fino that I wanted to open, so I went with Pedro Romero Amontillado, $12 (750 ml), Frontier Wine Imports. One of the many things to love about Sherry - you can open the bottle just to have a small glass and drink the rest over the course of the next week. Amontillado begins as Fino Sherry but oxidizes more quickly, either because the flor doesn't develop properly or is purposefully done away with. The resulting wine is darker and richer in color and flavor than Fino, and higher in alcohol - additional fortification is required so that it doesn't oxidize too quickly. I love the amber color - doesn't it look good? I think the wine is excellent and I can't wait to sip it over the week as it improves with air. But I must say that it was not a great match for the delicate flavors of the simmered mackerel. The Amontillado seems to need more boldly flavored food, like hard cheese or seafood cooked with lots of garlic, or even roast pork. Fino would have been better with my mackerel. So would Sake, obviously, but also a very light red wine, like a Poulsard. Or perhaps even a glass of mineral water. It was an early lunch on a Saturday, for goodness sake. Although I try to give some meaningful details, when I write about a wine I try to focus more on context than on descriptions of flavor or aroma. That said, many of you have contacted me in the past few months asking me to me more specific about aromas and flavors, to use more and better descriptors. 2007 Cupcake Vineyards Central Coast Cabernet Sauvignon, $11, full disclosure - this wine was sent to me as a sample. Oxblood purple with ruby rims and a sparkly garnet core. Aromas of black licorice (the Swedish kind that comes in little nuggets), cloves, coriander, cardamom, cumin, other spices that begin with the letter "c," pipe tobacco, cigar box, cigar, humidor, cedar, spruce, birch, oak, and brown licorice. Layers of sweet fruit, including black cherry, Washington State white cherry, red cherry, sour cherry, blueberry, strawberry, raspberry, Pinkberry, marionberry, lingonberry, blackberry, mulberry, cranberry, gooseberry, and huckleberry, with subtle undercurrents of black plum, red plum, yellow plum, and prune. The finish is a gentle kiss of caramel, salted caramel, espresso, macchiato, regular drip coffee, hazlenut, almond, Brazil nut, woodsmoke, and sandalwood. A great value at $11, particularly if you cannot afford to or do not wish to purchase all of those products individually.